TLC for Pets is ready to carefully manage your pet's surgical needs. Our general surgeons have decades of experience with procedures ranging from spays and neuters to more complicated tumor removals and orthopedics. We have been performing laser surgeries for over 10 years. We emphasize pain management and safety. A successful surgery is one that not only gets the job done but is also performed in a humane, pain-controlled manner and leads to a speedy recovery. We take numerous precautions to attend to your pet's safety as well. Our extensive in-house lab is useful for same day pre-op blood tests. We use state of the art anesthetics and closely monitor your pet's vital information during the procedures. Of course we can never guarantee the outcome of a surgery, but be assured that we are treating your pet as we would want our own pets treated. We like to follow up on our surgical outcomes as well. Most of our surgical procedures include one or two post-op visits with the doctor. Our trained veterinary technicians and other staff are often able to help with your basic post-op questions as well. We are usually just a phone call away if you have any concerns regarding your pet's progress or pain management. TLC for Pets can comfortably and conveniently take care of your pet when you are away. We normally provide drop off and pick up times seven days a week. We provide dogs with multiple walks including evening walks on weekends, and we keep cats happy in their separate kitty condo area. We are a small facility and pay close attention to the pets in our care. Since we do not have outdoor runs, we are able to keep our kennel fully air conditioned or heated. We feed in-house premium diets, but you can provide your own food instead. We can medicate and provide veterinary care and grooming. Our clients love the convenience of one-stop shopping. Please note that we can fill up rapidly, especially on holidays and summer weekends. Book early when possible! Please also note that drop off and pick up times may be limited on some major holidays. TLC for Pets provides many grooming services. Sarah, our professional groomer, turns every Monday into "Spa Day" as she dazzles us with great cuts and delicate care. We can also perform routine baths and comb-outs Monday through Saturday. Of course we can provide the simple (and sometimes not so simple) nail trim. 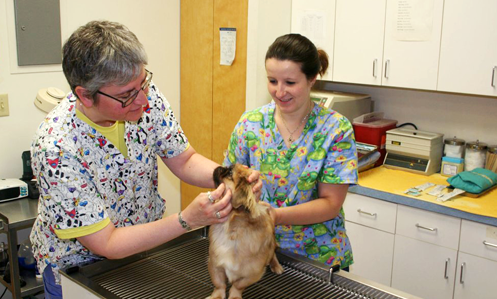 We can coordinate grooming services with our boarding, medical, dental and surgical services when needed. Please call for grooming details and appointments.